Welcome to the Yokohama Foreign General Cemetery Home Page. In the mid 1800's the city of Yokohama was only a small fishing village with a small population. Yokohama's first step in becoming a modern day metropolis began in the 1850's when this country was still bound by a strict isolation policy, which was enforced by the Tokugawa Shogun-ate, literally making Japan an off-limits area to the rest of the world. When Commodore Perry arrived with his black ships (Kurofune), they demanded that Japan renounce the national isolation and open up its ports to the world. Consequently the Japan-America Friendship Treaty was signed at the Yokohama village. Japan no longer a sanctuary for the Tokugawa Shogun-ate, and with the isolation policy shattered, the fall of the Tokugawa-Bakufu (government by the shogun-ate) and the introduction of the Western industrialization in Japan was imminent. 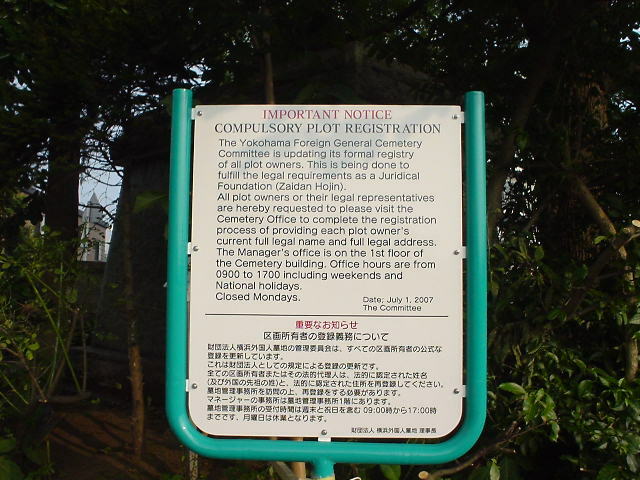 It was around this time that the Japanese government had allocated in the Yokohama Yamate area (Bluff) a sizeable area of land to be used as a cemetery for the foreign nationals who were living in Yokohama. As time passed, history witnessed two World Wars and the Great Kanto Earthquake also devastated the city of Yokohama. From around this time the number of available plots in the cemetery slowly dwindled and today regrettably there is only a extremely limited number of plots left. 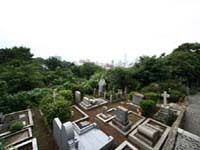 From the late 1800's the cemetery was operated and maintained by the Yokohama Foreign General Cemetery Executive Committee. The committee, which is comprised by an all-volunteer staff, is responsible for the finance, maintenance, upkeep, and the daily operations of the cemetery. Our task is to ensure that the cemetery is kept clean and in a financially sound situation, and to maintain an environment that will preserve the dignity of all the souls resting on this sacred soil. The Yokohama Foreign General Cemetery Committee is updating the list of all the plot owners for the Registry of the Cemetery . Bulletin Board of "IMPORTANT NOTICE" at Main Gate(Yamate-mon) and Meyer M. Lury Memorial Gate(Motomachi-mon) was installed by the Committee. Plot owners are requested to contact or visit the cemetery office and re-registrate the current owner's name with address, phone number and e-mail address. 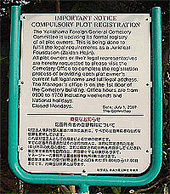 The Yokohama Foreign General Cemetery Committee is updating the formal registry of all plot owners. This is being done to fulfill the legal requirement as a Juridical Foundation (Zaidan Hojin). 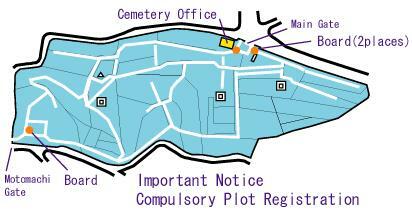 All plot owners or their representatives are requested to please visit the Cemetery Office to complete the registration process of providing each plot owner's current legal name and full legal address. The Manager's Office is on the 1st floor of the Cemetery building. Office hours are from 09:00 to 17:00 including weekends and National holidays. The annual expenses required for the operations of the cemetery are quite large, funds are required to pay for gardening works, restoration, land fortification, and salaries paid to the staff. With new plot sales no longer an option for a reliable source of income, the committee has in the past years launched an Open House Program in which a predetermined route of the cemetery is opened up to the general public for viewing. In lieu of such entry to the cemetery, visitors are asked to make a small donation equivalent of Yen 200 or more. Although being our largest source of income, funds from our Open House Activities alone cannot support the well being of our finances. The committee is actively seeking donations from individuals, organizations, friends and relatives of those buried in the cemetery. We are also seeking donations from people who sincerely wish to preserve the culture of this very important Historic Spot where the souls who lie therein have made a very important contribution to the development of the Modern day of Japan. Those of you who wish to make a donation, help as volunteer for our Open House activity or have any queries regarding the cemetery we would be happy to supply more information, and would appreciate if you could contact us through the "General Enquiry" page. The cemetery depends on your generosity. No donation is too small, nor too large. All donation go directly to maintain the cemetery. I also urge the readers if time allows to visit the cemetery on our Open House days, I can assure you that it will turn out to be a very informative and memorable trip. The cemetery is also located near many museums, historical spots, shopping centers and a visit to these surroundings will definitely be a pleasant trip for all.